Please refer to our stock # T177 when inquiring. 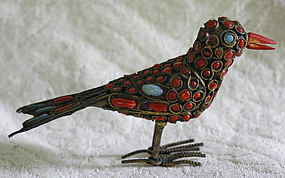 This antique type of metal work was common in Nepal during the 1800's and into the early 1900's. The birds beak is carved from bone which is dyed to color. The "jewels" are colored glass i.e. enamel drops of orange, turquoise and dark brown. Beak to tail tip the bird measures 3.5 inches and stands 2 inches high. Very good condition with one "jewel" missing on the side.